Use the sliders to position Mike’s arm in a starting and ending pose. Select the movie length and transition curve. The transition curve changes how Mike’s arm moves between the key frames. The total number of frames determines how long the action lasts. Play the animation you have created. Can you predict what motion each transition curve will create? How does the curve change the emotion? What other shapes would you like to try? This web activity was designed for a resolution of 1920 x 1080 on Chrome, Firefox, and Safari browsers. 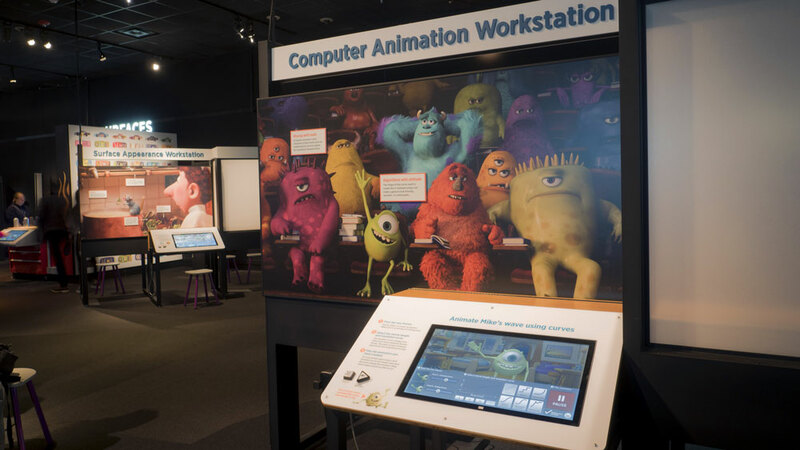 As this software is adapted from The Science Behind Pixar physical exhibition space, please treat it as experimental. Photo of the Computer Animation Workstation activity. See above to launch activity.